For the very first time American R&B superstar Brian McKnight would perform in the motherland this weekend. The event which was formerly scheduled during the Christmas holidays would now take place this Saturday January 30, 2016 at the Eko Hotel, Lagos Nigeria. 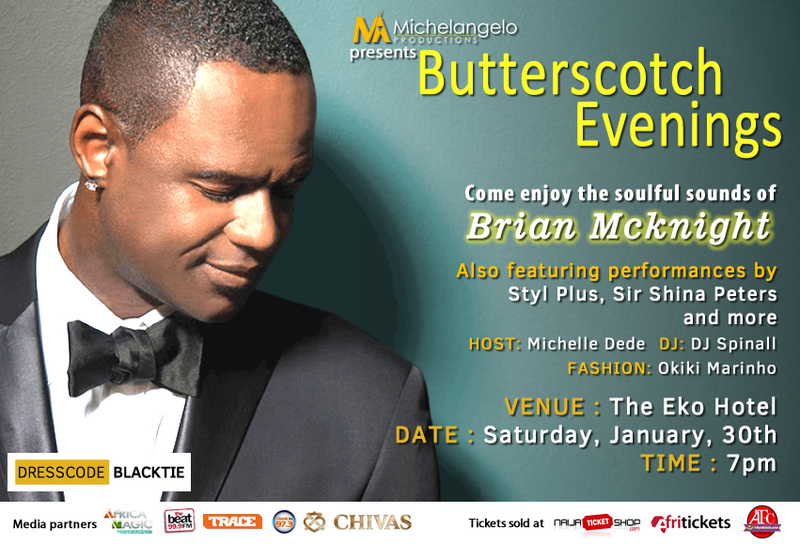 ”Michelangelo Productions presents a new date for Butterscotch Evenings 2016. The 3rd edition of Butterscotch Evenings will now take place on Saturday, 30th January 2016 at Eko Convention Center, 7pm prompt. Following years of successfully hosting Lagos to the most exquisite dining and world class entertainment, Michelangelo Productions is excited to announce that the headline act Brian McKnight will be performing alongside Sir Shina Peters, Styl Plus and others. Next Weekend Events: Gidi Bazaar Is Back For The Second Time!